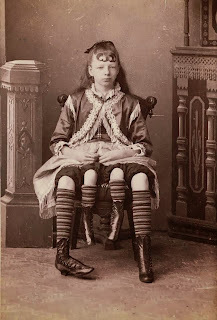 Myrtle Corbin, was known as the Four-Legged Woman – however that moniker was slightly misleading. While at a glance one could plainly see four legs dangling beyond the hem of her dress – only one pair belonged to her, the other set to her dipygus twin sister. Born in Lincoln County, TN in 1868 and spending most of her childhood in Blount County, AL – where s...he can be found in the 1880 census – her condition was incredibly rare. The tiny body of her twin was only fully developed from the waist down and even then it was malformed – tiny and possessing only three toes on each foot. Myrtle was able to control the limbs of her sister but was unable to use them for walking and she herself had a difficult time getting around as she was born with a clubbed foot. Technically, the ‘Four-Legged Woman’ only had one good, usable leg. Myrtle was a popular attraction with P.T. Barnum, and later with Ringling Bros. and Coney Island. Her popularity was likely linked to her showmanship – she would often dress the extra limbs with socks and shoes matching her own and this gave her a truly surreal appearance. Myrtle was so popular that she was able to earn as much as $450 dollars a week. At the age of 19 Myrtle married a doctor named Clinton Bicknell. It was then that other aspects of her bizarre anatomy became evident. 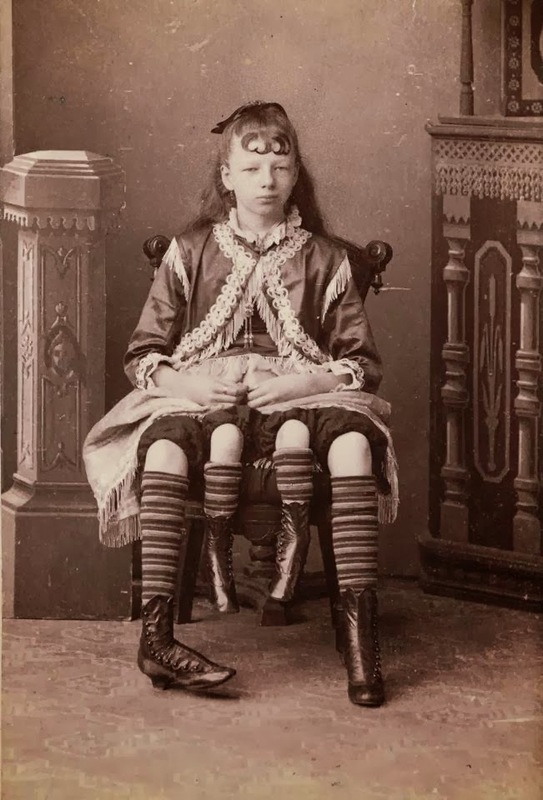 It seems that her twin sister was also fully sexually formed – thus Myrtle possessed two vaginas. She had four daughters and a son and it has been rumored that three of her children were born from one set of organs and two from the other. Whether this is true or not; it is medically possible. In Anomalies and Curiosities of Medicine by George M. Gould and Walter L. Pyle it was observed that both vaginas menstruated – thus indicating both were possibly sexually functional. Myrtle passed on May 6, 1928, surrounded by family and friends.